When I decided to write my first book, the process was arduous but definitely worth it. I knew I wanted to write something worthwhile so I decided I needed to address the issues that men face in today's society. One of them being that we are weak if we express and show emotion and feelings. Meanwhile, women want a man who is able to express himself but not do it too much to where he isn't manly enough. So I started to think about things we as men struggle with along with things that I struggle with on a daily basis. I knew I had to incorporate all of the things I see and deal with on a regular basis and then add some things to it such as a young man who's made mistakes and is learning things about life along the way. It took a good 2 weeks to brainstorm all of the ideas and writing down things I wanted to address and discuss in the book. I knew I was good at writing poetry so that was the only format I saw myself writing in. I've been writing poetry since I was 13 years old but I never took the time to write a story. I didn't want to make the story too long but surely didn't expect to write a Part 2 (which will be ready sometime in 2017). I had to address the struggles some of us deal with growing up, sometimes our circumstances are harder than others and it's a process with growing and learning about yourself and others. 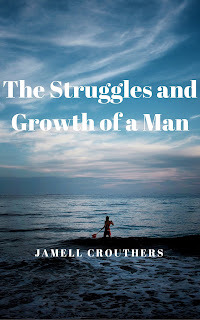 The Struggles and Growth of a Man was written within a month and it was because I had time to write and I had a lot to share. People need to know we struggle too, we need hugs, comfort, warmth, a listening ear and advice from others. Society has drilled into our minds that men need to always be strong, mentally tough and be aggressive along with assertive at all times. Sometimes we don't want to be that way, we just want to vent and relieve ourselves of the daily struggles of life. My book is in stores now at a low price for eBooks and Paperbacks can be ordered on Amazon so take advantage of the low eBook price, it won't last long. My author profile is below where you can get excerpts of my book and insight. Be good and follow your dreams!